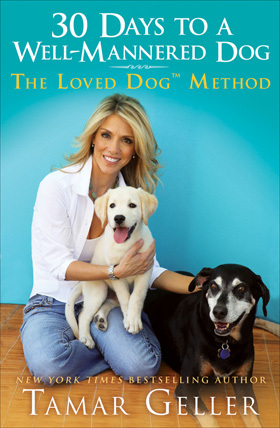 Tamar Geller, founder of The Loved Dog, is a renowned life coach for dogs and the people who love them. She prefers the term “life coach” to “dog trainer” and “well-mannered” to “obedient.” You can read her “30 Days To A Well Mannered Dog.” Tamar rejects both the notion that a dog needs to be submissive as well as the usage of painful prong collars and choke chains that have been common tools of dog trainers for decades. Her bestselling book, “The Loved Dog: The Playful Non-Aggressive Way to Teach Your Dog Good Behavior” and her DVD, “Celebrate Your Dog! The Loved Dog Way of Training”, walk dog owners through her innovative and revolutionary approach to dog coaching (training) — one that is light-years ahead of the typical dog training. Tamar became interested in dogs as she watched their training while serving as an Intelligence Officer with the elite Israeli Army Special Forces. After finishing her service, she had the extraordinary opportunity to study wolves in their natural habitat, observing that they taught their young primarily through games. She says, “Dogs have the remarkable power to transform the lives of the humans they touch. They have the uncanny ability to understand humans, working side-by-side with us and sharing our lives. As a life coach for dogs and their people, I have dedicated myself to providing insight to millions of dog lovers with my unique method, The Loved Dog, for building a relationship based on games, clear communication, respect and love. I am devoted to capturing the individuality of each and every dog and celebrating the magic in them. Tamar provides insight to millions of dog enthusiasts nationwide as the resident dog expert on The Today Show. Tamar has also appeared on The Oprah Winfrey Show (while coaching Oprah’s puppies), Animal Planet’s Who Gets the Dog, Larry King Live, 20/20, Live! With Regis & Kelly, Ellen, Fox News, Good Morning Britain as well as in the pages of USA Today, Newsweek, US Weekly, The Los Angeles Times, LA magazine, Men’s Health, Parents and Self magazine, among others. She is the go-to coach for celebrities such as Oprah Winfrey, Larry King, Ellen DeGeneres and Portia de Rossi, Ben Affleck, Hilary Swank, Natalie Portman, Courtney Cox-Arquette, Nicollette Sheridan, Owen Wilson, and Brad Paisley among others. An active humanitarian and doggytarian, Tamar has created The Loved World Foundation by Tamar Geller. Understanding firsthand the challenges of being a veteran, Tamar has created a nonprofit program Operation Heroes & Hounds that measurably empowers the lives of veterans and shelter dogs. Using her Loved Dog™ method, shelter dogs help wounded military personal and juvenile prisoners in their integration back into society. Her extraordinary vision has also led Tamar to open The Loved Dog™, Southern California’s first cage-free doggie daycare and boarding facility, in 1996, a concept that was ridiculed at the time, and now can be found at any major cities in the United States. She is serving as an advisor for The Humane Society of the United States and Best Friends Animal Society.